Amatrol’s Sorting and Distribution Station (87-TMS3) teaches about robot-based inventory systems, which provide orderly and logical storage of materials. 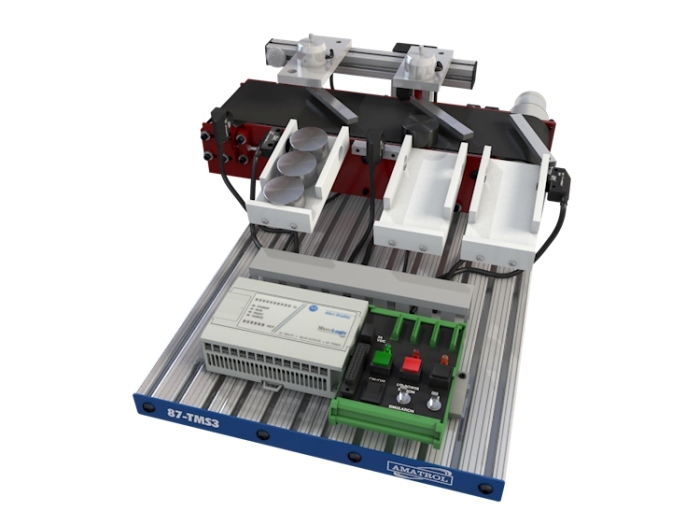 It features a conveyor, three industrial sensors, sorting chutes, electric solenoid actuators, an AB1000 PLC, 10 inputs, 6 outputs, and much more! This durable, affordable learning system provides a portable solution for situations where mechatronics training is needed in multiple locations or when training space is limited. The 87-TMS3 can be a stand-alone system that offers real-world skills for careers in this vital industrial area or it can be combined with the Inventory Feeding Station (87-TMS1) and the Inspection & Indexing Station (87-TMS2) to form a fully automated line on a tabletop! The 87-TMS3 curriculum combines a depth and breadth of theoretical knowledge and real-world automation skills that’s unmatched in the industry. Key learning areas include: sorting module operation; parts storage operation; flat belt conveyor adjustment; sorting module sequencing; multiple station operation; and much more!